Your choice of wheelset influences your Zwift speed significantly since it impacts both weight and aerodynamics. 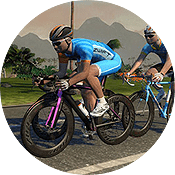 And Zwift’s recent release of the Drop Shop has given us access to lots of wheelsets: 26 now, with more on the way! Wheel choice for flat/mixed courses has already been discussed. What about climbing? 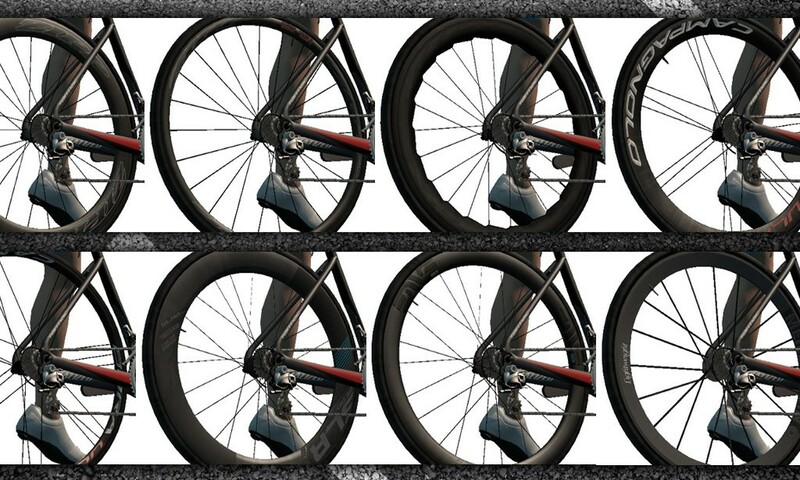 When aerodynamics matter less and weight matters more, which wheelset should you choose? The “which bike frame or wheelset is fastest” question isn’t as easy to answer as you might think. Each piece of equipment has unique weight and aerodynamic (CdA) values, making them perform in ways that mirror outdoor physics. Lighter items perform better on climbs, while more aerodynamic items perform better on the flats. Differences between options will also be magnified or minimized by your own power levels, drafting abilities, and more. Below you will find the 9 fastest wheelsets for longer, steeper climbs. This would include big Zwift mountains like Alpe du Zwift, the Epic KOM, or Innsbruck’s KOM. This isn’t an exact science, but we’re pretty confident in our findings thus far. This list is based on our recent speed tests of 100+ rides up Alpe du Zwift, a 12.2km, 8% monster of a climb. We tested all wheelsets using the same power levels, rider weight, and bike frame. This made it easy to spot which wheelsets performed best. We then ranked those wheelsets based on their climbing performance, using their flat/mixed course performance as a secondary factor when needed. These wheels are super-premium IRL, and their price reflects that. Luckily for us, we can get them free by just riding up the Alpe! Problem is, it may take one try… or 25. Nobody really knows how often the spinner lands on the Meilensteins, but they’re definitely a prize worth winning. These wheels arrived with the Drop Shop, and they’re excellent climbers indeed, at a low price and level unlock. The 3.4’s turn in nearly the same Alpe times as the Overachieve SLR 0, but they outperform the SLR0 on flat/mixed courses so we gave them the nod. Another new wheelset, these are actually made by Giant IRL. Slightly lacking in aerodynamics compared to the top competition, they definitely have the light weight necessary to turn in a fast Alpe climb time. These actually climb just slightly slower than the Bora Ultra 35’s, but they vastly outperform the 35’s on flat/mixed terrain so we ranked them higher because you have to get to the Alpe before you can climb. Plus you want to feel the wind in your hair on the way down! Same story as the Bora Ultra 50’s. These climb slightly slower than the Bora Ultra 35’s, but vastly outperform them on flat/mixed terrain. A solid all-around wheel. The 404’s perform very much like the 454’s up the Alpe, but the 454’s outperform them on flat/mixed courses. Then again, the 404’s are much easier to obtain! These wheels perform decently well up the Alpe, but their performance on flat/mixed courses is rather dismal. Definitely a “pure climbing” wheelset like the Zipp 202 and ENVE SES 2.2. Formerly the king of the climbing wheelset hill, the diminutive Zipp 202’s have dropped to the “bottom of the top” due to their lackluster aerodynamics and slightly slower performance up the Alpe. Still a decent climbing wheelset, and one of the easiest to obtain. The ENVE SES 2.2 wheelset consistently matches the Zipp 202 in terms of performance, so we included it in the list even though it’s a bit harder to obtain than the 202’s. Only 9 seconds separate the Meilensteins from the Zipp 202s up the Alpe at 300 watts with a 75kg rider on a Zwift Aero frame. The next wheels are 2+ seconds behind, so we opted to not include them in the above list even though they far outperform climbing-specific wheels on flat/mixed courses. Again, your best Zwift race setup depends on our specific situation, so do your research and choose wisely. Feel free to sift through our raw data at your leisure! Watch for upcoming posts discussing the best TT and road frames for extended and steeper climbs. These are very different lists than our already-posted 3 Fastest* TT Bikes and 9 Fastest* Bike Frames, which targeted performance on flat and mixed courses. Hopefully, you mountain goats found this post useful. Got questions or comments? Post below! Excellent data based stuff, thank you. What are the reasons against using the Lightweight Meilensteins all the time if you have them, that is how much slower are they than deeper but heavier wheels? They’re pretty slow on the flats (see data https://docs.google.com/spreadsheets/d/1_dvNbBEKAztJwjX-2CDdWmVSR4jP92o-eiNCB7hl5IY/edit#gid=1825340343)… 19s slower than the Zipp Disc setup on 1 35 minute lap of Volcano Climb. Which I don’t think reflects IRL performance at all… those Meilensteins are pretty amazing wheels outdoors! Thanks Eric, Yes I got my fastest time Up the Alpe with the Meilenstens Wheels, it took some climbing on my part only got when I was on my 40s or 50s goes up the Alpe. Mostly ride up the Alpe now on the Tron Bike 100+ rides up so far. Now if was possible to change the wheels on the Tron that could be another story. I’ll release a post in the next day or two about the best climbing frames, but suffice it to say the Tron is not in the top 10, if you’ve got a good wheelset! Apparently Zwift added some weight to the Tron when they revised stuff with the Drop Shop release. 40’s-50’s? Man, and I was frustrated at it taking until my 14th ascent to get them. Good job on getting over 100 ascents. That’s a lot of seat equity. I’m not a fan of changing the order of climbing wheels around based on performance on the flats. The best climbing wheels should be the wheels that are the fastest at climbing. Here are the actual results for the safety bike and zwift aero bike. Interestingly, the aero bike seems to favor being paired with aero wheels slightly more than the safety bike, but the results are so close that it could just be noise. Yeah, I get it. That’s one reason why I keep the raw data accessible, so people can draw their own conclusions. So is it better to use the best aero or the best climbing frame/wheels for a course such as The Pretzel that goes over the epic KOM twice? No easy answer here, Jamie. For me, I look at where I struggle the most, and try to equip myself to help me struggle less. So I’m a bigger guy (82kg), which makes me struggle on climbs while it’s easy to hang with the group on flats. Therefore, I choose more climbing-centric wheels on courses with significant climbs, to give me an advantage when I need it most. Eric, I’m a fan, and have been really enjoying the posts all week. I know that you must be very tired of testing, but one thing I’d be interested in seeing (if Zwift allows) would be a deeper dive into the aero effects in climbing. For example, we can see that the order of results for fastest wheel on the Volcano Climb don’t match the Alpe. I wonder whether that is simply due to the increased gradient of the Alpe (my suspicion) or whether it also has to do with length of climb. I think a test of fastest wheel up the middle-length but less steep Epic/Innsbruck KOM could be fascinating, to see whether it would be closer to the Volcano Climb or the Alpe. Anyway, could be some guaranteed page views for mid-summer or something. Thanks again for all the diligent work on this! Thanks, Daniel. Yeah, there are lots of other tests that could be done, for sure! Maybe the summer is the time. Really interested in the upcoming climbing bike data to see if there is any material difference in the specialized tarmac vs the tarmac pro. Yeah, I found that interesting as well! and that is greatly appreciated Eric. All that climbing for the tron bike, and you don’t even get a climber of a bike (though a great all rounder). Guess they figure you don’t need a climbing bike if you’ve already done that much climbing! Thanks, good job I managed to pick up the disk / 808 combo the other day! Thanks again for all your testing Eric! You have outdone yourself with this series of articles! great work Eric. i noticed the Zipp disc stats changed after the kerfuffle making them available in the Drop Shop. when they were for sale in the Drop Shop the weight had four stars. the weight now only has one star. did they make them heavier for those of us who didn’t get the Disc set as part of the beta? All the wheels showed 4 stars for weight when the Drop Shop first arrived. It was an art error, which they fixed with the next update. They didn’t change the weights though with that fix, just the artwork. That’s good to know that they only changed the art, not the stats. Thanks for sharing. And the weight of the zipp 202 wheelset is 1450g in the real world, zipp 404 is 1615g. So it’s just not possible the 404’s are faster then the 202’s uphill. 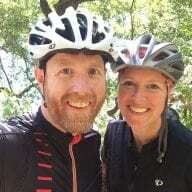 I rode the NYC Everything Bagel today with the Speci Allez Sprint and the Lighweight Meilenstein. Felt pretty slow on flat roads. After that I bought the Enve 3.4 wheels. They should perform nearly als good as the Meilenstein on climbs but very better at flats. Right? I need some assistance in understandy why the 404’s would out perform the 202’s for example on a climp or even on the flat, are the Star values in Zwift only there to mislead? Q. The 202’s have 3 stars for Aero and 4 for weight, just like the Enve ses 3.4s, where as the 404s have 3 stars for Aero and 2 for Weight. My Bike at the moment is the Specialized Tarmac (Standard).